Osteoarthritis of the cervical spine may be defined as a degenerative disorder of C1-C7, complicated by inflammatory reactions. It is a very complex disease with multiple causes which affects the intervertebral discs, vertebral bodies, intervertebral ligaments, the hyaline cartilage, the underlying bone, joint capsule, zygophyseal joints and/or can lead to the formation of osteophytes   or subchondral cysts and/or can cause hypertrophy of the articular process. Although cervical osteoarthritis is often referred to as cervical spondylosis , it is not clear whether these two concepts may be considered synonyms. 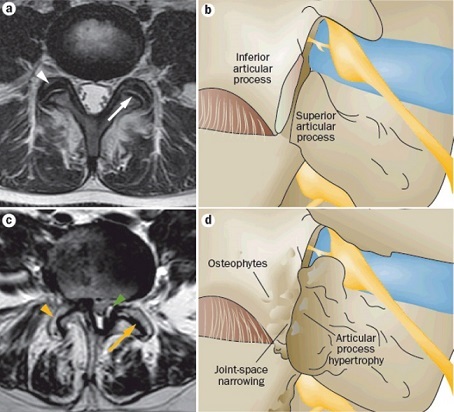 Uncovertebral joints: Osteophytes are formed on the articular surfaces of the uncinate process. These osteophytes can impinge anatomical structures like the cervical spinal cord, spinal nerve root, radicular artery, vertebral artery and cervical sympathetic trunk. Facet joints (Figure 2): which are inclined 45° from the horizontal. The joint surfaces are generally planar, but not flat. Intervertebral discs: between C0–C1 and C1-C2 there is no intervertebral discs. Major factors in the development and progression of osteoarthritis of the facet joints are joint alignment and load distribution. Cervical osteoarthritis may be generalised, sometimes involving the entire cervical region, but it is usually more localised between the 5th and 6th and the 6th and 7th cervical vertebrae. Anyone can develop cervical osteoarthritis, but it is rare in people younger than 40-50 years, the incidence increasing with age,  women having a higher risk for cervical OA than men. It is common in people above the age of 50 and especially if those people who have had jobs that included remaining in a single static position for long periods, i.e. reading, writing and other desk based careers. Incidence of cervical OA can have many causes. i.e. mechanically over-stressing of a joint (e.g. working with tools which generate intense vibration), previous bone fractures or other injuries to the neck, overload at young age, postural asymmetry or asymmetric loading of a joint. Hartz et al suggest that there is a relationship between the severity of cervical osteoarthritis and a higher body weight of the patient. 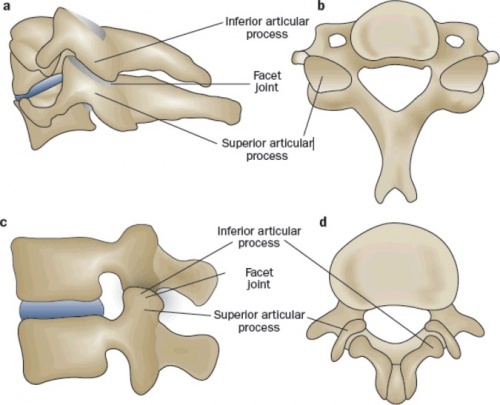 Facet joint osteoarthritis (FJOA) is intimately linked to the distinct but functionally related condition of degenerative disc disease, which affects structures in the anterior aspect of the vertebral column. FJOA and degenerative disc disease are both thought to be common causes of back and neck pain, which in turn have an enormous impact on the health-care systems and economies. OA is characterised by pain, stiffness, crepitus, limited range of movement and sometimes joint instability and mild synovitis  The pain is usually localised around the affected joint, but referred pain may occur. Pain associated with FJOA can arise from nociceptors within and surrounding the joints, including nociceptors in the bone itself, as the facet joints and their capsules are well innervated . Pain can radiate to the occiput, the medial border of the scapula and the upper limbs . Pain often becomes worse with joint movement and can be more severe at the end of the day. Morning stiffness can be a common feature, but usually dissipates quickly . Restricted movement can occur due to pain, capsular thickening and the presence of osteophytes . Osteophytes can form around the intervertebral joints and cause neurological symptoms due to compression of the spinal nerves (Cervical Radiculopathy) . Narrowing of the spinal canal (Cervical Stenosis) can also cause compression on the spinal cord and circulation problems from compression of vascular structures. Performing an MRI can be useful to confirm the presence of any spinal cord compression (Cervical Myelopathy). Prolonged peripheral inflammation in and around facet joints can lead to central sensitisation, neuronal plasticity, and the development of chronic spinal pain . Functional status and disability measure (evaluation of the activities of daily living) can be assessed by the Neck Pain and Disability Scale (NPAD) and the Neck disability index (NDI). The Neck pain and disability scale (NPAD) is a composite index including 20 items, which measure the intensity of neck pain, its interference with vocational, recreational, social, and functional aspects of living and also the presence and extent of associated emotional factors. The Neck disability index (NDI) is a patient completed and condition specific functional status questionnaire. This questionnaire consists of 10 items, including pain, personal care, lifting, reading, headaches, concentration, work, driving, sleeping and recreation. This questionnaire has been designed to give information as to how neck pain has affected the patient’s ability to manage in daily life. The NPAD and NDI are both seen as valid measures of self-reported neck pain related disabilities. Inspection: posture, edema, erythema, evidence of trauma, muscle atrophy, skin abnormalities and joint deformity. Palpation of facet joints, examining of anatomic abnormality, temperature and tenderness. Range of motion of the cervical region and shoulder region. Stress of the facet joints: pain increases with hyperextension, extension-rotation of the neck. Pain decreases while doing flexion of the neck. Neurological evaluation: motor and sensory evaluation of sensation, reflexes and muscle strength. Other special tests may be indicated: L’hermitte sign, Hoffman's test, Babinski. Muscle testing: searching myofascial triggerpoints in the sternocleidomastoid, cervical paraspinal muscles, levator scapulae, the upper trapezius and suboccipital musculature. The following medical management strategies are only indicating when all other conservative treatment has failed. Intra-articular corticosteroids are recommended for hip and knee osteoarthritis. The effects of corticosteroids on cervical osteoarthritis need to be researched. There are indications that excision and fusion of the anterior cervical intervertebral disc (Cloward operation) together with the removal of associated arthritic bone spurs pressing on the nerves and spinal cord can give relief of pain and muscle weakness in patients who have cervical osteoarthritis with neurologic pain. Patients with atlantoaxial (C1-C2) facet joint osteoarthritis have a positive reaction on pain after the fusion of these two facet joints with transarticular screw fixation. This treatment has a relative low rate of serious complications. Laminoplasty is used to decompress the cervical spinal cord. A risk of this surgical treatment, however, is reduced strength and shear stiffness (SS) of motion segments and the patient can suffer from instability as a result. Numerous patients also had neck pain following surgery. . In the short-terms some benefit may be gained from using chondroitin (alone or in combination with glucosamine). Benefits have been shown to be small to moderate, but clinically meaningful. Treatment for cervical osteoarthritis is usually conservative and it can be treated using a variety of therapy possibilities with exercise therapy being a key element. Exercise includes mobilisation exercises, strengthening local muscles around the affected joint and improving overall aerobic fitness (LoE5) (LoE1B) There is considerable evidence that suggests physical activity can help in the management of chronic pain and should play a key role in the overall treatment plan. This will improve the disability over time and has other multiple health benefits. Manual therapy, such as massage, mobilisation, and manipulation may provide further relief for patients with cervical osteoarthritis. Mobilisation is characterised by the application of gentle pressure within or at the limits of normal motion to improve ROM. Even though there is a lack of evidence for the application of local heat or cold, it is often used by patients with OA to decrease pain. TENS can also provide symptomatic relief. It has been suggested that this treatment causes the stimulation of cartilage growth at the cellular level, yet there is a need for further large scale studies of pulsed electric stimulation to confirm these finding. It is thought that magnetic therapy represents an alternative therapy for patients suffering from cervical OA. Electromagnetic fields can be applied to treat cervical OA and are thought to have a pain-relief effect, but further studies are needed. ↑ 12.0 12.1 Arno Bisschop, Which factors prognosticate spinal instability following lumbar laminectomy?,Eur Spine J. 2012 Dec; 21(12): 2640–2648. ↑ 13.0 13.1 Singh J.A. et al., Chondroitin for osteoarthritis, 2015, Cochrane review. ↑ 16.0 16.1 16.2 Peter W.F. et al., Physiotherapy in hip and knee osteoarthritis: development of practice guideline concerning initial assessment, treatment and evaluation, Acta Reumatol Port, 36 (2011), pp 268-281. ↑ 17.0 17.1 Loew L. et al, Ottawa panel evidence-based clinical practice guidelines for aerobic walking programs in the management of osteoarthritis, Arch Phys Med Rehabil, 93 (2012), pp 1269-1285. ↑ Mike Murray et al. Specific exercise training for reducing neck and shoulder pain among military helicopter pilots and crew members: a randomized controlled trial protocol, BMC Musculoskelet Disord. 2015; 16: 198. ↑ KNEW WW. Neck Pain Guidelines: Revision 2017. J Orthop Sports Phys Ther. 2017;47(7):511-2. ↑ Sinusas K., Osteoarthritis: diagnosis and treatment, Am Fam Physician, 2012 Jan 1;85(1):49-56. ↑ Robert W. Rand and Paul H. Crandall, Surgical treatment of cervical osteoarthritis, Calif Med. 1959 Oct; 91(4): 185–188.